“From Washington to Miami the cry is the same: Give me Tryon grapes.” So claimed prominent Tryon vineyardist W.T. Lindsey, writing in the Polk County News in 1919. Lindsey was hardly exaggerating. From the 1890s until the lead-up to World War II, grapes grown in the Tryon area were prized by consumers and winemakers across the East. Considering vineyardists were starting from scratch in the wake of the Civil War, the grape’s triumph during this period was no small feat. The popularity of the fruit grown in Tryon was largely achieved through the labors of growers such as Lindsey, but a unique combination of geography and climate (factors known to winemakers as terroir) helped set the stage for success. The area’s soils “are poor, deep, and rocky, and those are the best soils for wine grapes,” explains winemaker Frank Lilly of modern-day Overmountain Vineyards. Even more significant is the effect of a thermal belt, stretching across the region at an elevation of about 1,200 feet. The air in this swath remains relatively warm, making grape-killing frosts uncommon. Though the area experiences few frosts, it isn’t immune to extreme weather fluctuations like drought and rain. Annual weather variations differentiate Tryon from other American grape-growing regions such as California, where conditions are largely consistent year after year. But while excessive rain can cause problems, from diluting the fruits’ sugars to promoting fungus Florida when climate-related health problems led him north. What was meant to be a sojourn in the Asheville area brought about a new life. Learning of the favorable growing conditions, he purchased 50 acres and founded Tryon Vineyard. It’s believed that LeMort learned winemaking during his youth in France, and that he used his knowledge to teach fellow vineyardists like Doubleday how to turn their crops into wine. If Tryon’s climate was responsible for attracting vineyardists and producing high-quality grapes, it was the town’s increasing accessibility by train that helped establish the fruit’s reputation across the region and beyond. During the 1890s, six passenger trains stopped in Tryon each day. Ulysses’ son, Harold Doubleday, and a new business partner, Sidney Lanier Jr., took over the vineyards following the general’s death in 1893, and were among the first to recognize the locomotives’ marketing potential. They popularized their wines by distributing samples as cars rolled in. Vineyardists who didn’t produce wines and local opportunists soon got in on the action; peddlers began to appear at the depot with grape-stuffed wooden crates, ready to sell their wares to hungry passengers. The railroad also enabled the safe shipment of fruit. Before long, word of Tryon grapes began to spread among consumers, winemakers, and retailers. The early years of the 20th century brought a formidable challenge for the industry: Prohibition, which took effect at the state level in 1909 and became national law from 1920 to 1933. Though the ban on alcohol devastated many of the nation’s vineyards, the grape industry in Tryon reached a zenith during this period. This seeming paradox was largely the work of Lindsey, who remained an active vineyardist from 1898 until his death in 1922. In addition to conducting useful research about grape varieties and planting techniques, Lindsey was a tireless salesman who understood the importance of brand recognition and product appearance. He took out newspaper advertisements to spread the reputation of Tryon grapes, helped design new baskets that would preserve the appearance of the shipped fruit, and founded the Tryon Fruit Exchange, an organization that centralized the sale of local grapes. In addition to equalizing prices for the town’s growers, the exchange standardized the quality of grapes marketed under the Tryon name. Despite the repeal of Prohibition, the local grape industry began to ebb during the latter half of the 1930s. A number of factors contributed to its decline, from the development of hardier grapes in other states to the gradual reduction in local railroad services. North Carolina farmers turned to Prohibition-proof tobacco as a main crop. By mid-century, vineyards had begun to grow over. 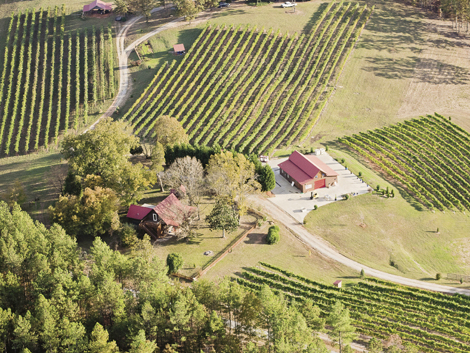 In recent decades, grape-growing has shown signs of a renaissance in Tryon and Polk County, which currently claims three wineries and about a dozen vineyards. The once-celebrated Tryon grape is on the rise again.